The first season of Hannibal largely revolves around The Chesapeake Ripper. The Chesapeake Ripper is the biggest serial killer the FBI has on it’s radar. The Ripper disturbingly mutilates his victims, and removes their organs, and while it’s been two years since the Ripper last struck, he’s finally back for more. Jack Crawford lost a trainee agent last time the Ripper was around, and doesn’t want to make the same mistake twice. After a run in with a serial killer known as the Minnesota Shrike, Will is just worried that his empathy is overwhelming his life. 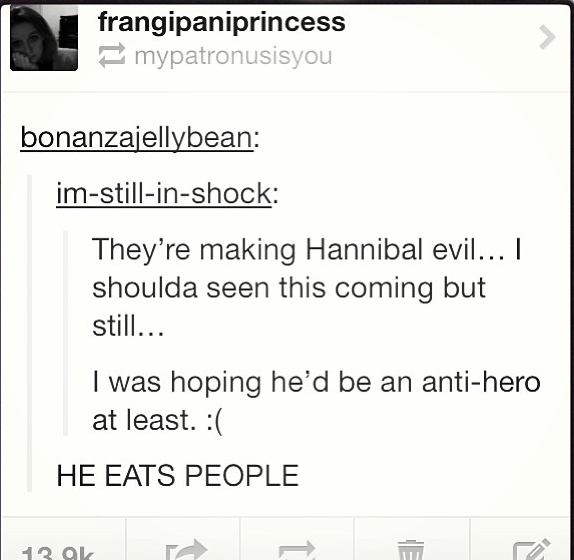 And Hannibal, well. Anyone who knows anything about Hannibal Lecter will be able to put two and two together. As creepy and sickening as the show can be, it’s truly amazing. And the fandom just makes it even better. Known as the Fannibals, they use just enough humour to make being obsessed with a show about a cannibalistic serial killer acceptable. The official NBC Hannibal Tumblr even gets in on it, writing hilarious tags for the pictures they upload. Tags which are then brilliantly used by the fandom, such as on this tumblr. It’s just so amazing and totally worth the fact that you will second guess everything you eat from the moment you begin watching it. Just a word of warning, from someone who has repeatedly made this mistake: do not watch Hannibal immediately before eating. You. Will. Regret. It. Hannibal has just been renewed for a second season. It airs on Channel Seven in Australia.